The holiday rush may be mellowing down around the world, but such is not the case for Cebu—the celebratory spirit continues with the grandest festival in the country, Sinulog. 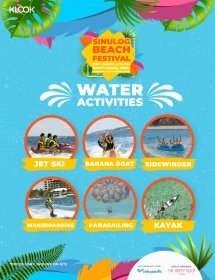 Klook, the world-leading travel activities, and services booking platform is set to kick off the festivities with the Sinulog Beach Festival, in partnership with Cebu Pacific Air and Havaianas, at Happy Beach Cebu on January 18, Friday, from 2:00 PM onwards. Expect a day of fun under the sun with interactive on-ground carnival games and water activities, sunset sessions with Cebu’s homegrown musicians such as Mandaue Nights, Sepia Times and others, and party the night away with live set performances from Manila DJs Deuce and Nix Damn P!, along with John Bosque, Renzo Senining, and Victor Jao. Get your tickets to the Sinulog Beach Festival through the Klook App! Early birds can choose between a festival kit or an exclusive Inflatable Island access pass as a freebie while those who are planning to welcome Sinulog 2019 with their beach buddies can get their tickets for as low as P500 with the Sinulog Beach Festival Barkada Bundle! Festival tickets also include free shuttle services between Cebu/Mandaue City and Mactan Island for a hassle-free beach party experience. Founded in 2014, Klook provides travelers a seamless way to discover and book attractions, tours, local transportation, best food trips and must-eats, and unique experiences around the world. Download the Klook App and enjoy P200 off on your first booking when you use promo code <KLOOKIT200>! Visit their website at http://www.klook.com and follow them on Facebook at @klookph and on Instagram at @klooktravel_ph.